Not posted for a while but I was wondering if you can give me sound advise as Im going to be changing the coffin arms on my 2002 c4s, should I also be changing the control arms & the inner tie rods while im having the works done ( & top mounts )? my thinking is I may as well change all in one go. Look forward to a few comments from you guys. Having learnt from experience, I only had done my coffin arms on the front. It didn't solve the clunks that I was getting from the front end. So a couple of weeks ago I did my complete front end. Meyle coffin arms, Meyle tuning forks, trw boots, inner, and outer track rod ends. I got the coffin arms, tuning forks and bolts as a kit from design911. The rest I got from online sellers. The difference it made to the front end which was washy before is incredible. I had done my top mounts a year ago when replacing springs and definitely recommend replacing if they have not been done . If your doing the front consider doing the back at the same time, just did mine and the bushes had all gone. Feels like a different car now after getting the GEO done, I have a cobble road to get to work and now all the creaks and groans have gone. I had mine rebuilt by CG this summer. I bought many of the parts from Spyder (near Woking), good value and the parts are fine. CG advise that rear upper arms should be bought from Porsche only as they have had issues with copies but they rarely need doing - I didn't change mine. I also left the front roll bar bushes as I got the wrong size from ECP and mine were ok. Worn tuning forks cause knocks even though they seem ok on the car. I think inner control arms are difficult, CG had a special tool for the job, Demort may be able to advise. My car was very good underneath and everything came apart easily, others have not been so lucky. Lots of aluminium grease should keep it ok. I'm not too far away near Purley if you want to meet up, I'll be at the Sidcup meet on the 28th. With a bit of research you can find OEM parts much cheaper elsewhere - my C2 front sachs top mounts came from Autodoc in Germany for less than £50 a pair delivered and have the porsche part number ground off them! Just allow a bit longer for delivery. One thing to consider is the small extra cost of fitting these bits when its apart anyway... the parts prices are small relative to the labour of stripping it down each time, or time cost if DIY. Also, many bits require a geo adjustment, which is a not inconsiderable cost. I did mine drip by drip as knocks appeared over a year or so. I wish I just did them all at once and then got it setup properly once. Top mounts and bearings, 4x coffin arms, inner/outer track rods, rear track rods, rear dog bones, 4x forked arms. May as well whack in some Koni shocks while its apart. Do the engine and gearbox mounts too. I bought the reconditioned arms from Hartech. Rear done. In the process of doing the front. See recent thread on here about replacement woes if you are going to do it yourself. Very doable DIY, but Allow time for seized bolts etc. Buy a decent ball joint separator tool. Start soaking all the nut and bolts in penetrating fluid ASAP - even if you are going to get a garage to do it. It means getting down on the ground every few days and spraying it in, but in my case it helped greatly. 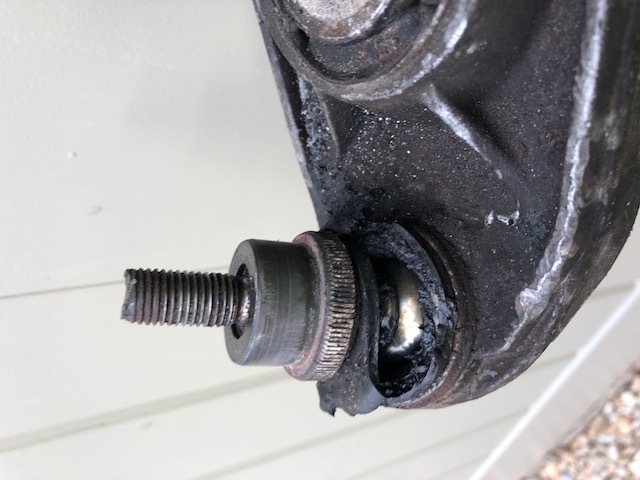 Consider changing drop links and anti roll bar bushes at the same time. Thanks for the response re the changing of the coffin arms etc on my c4s, well it seems ive opened a can of worms on this one changing this & replacing that while the car is pulled apart but it make perfect sence so ive decided to start ordering parts over the next few months then get my indy at NJS Solutions ( can help mentioning nigel at NJS, top bloke ) to undertake the works as its looking more than just a sunday job for me & the weathers getting colder. Anyway thanks for the return posts ( everyone ) its good to get sound advice on the forum. happy to have a drive to the Sidcup meet on the 28th & say hello as im only a couple of miles away, coffee & a chat sounds good to me so forward details & I shall see you there. See Hartech rebuilt ones already mentioned. I replaced my 944 control arms with the Hartech items which are supposed to be a bit stronger than the original (and cheaper). My advice for the front would be. Replace everything at once - Forks, lower arm, steering knuckles, top mounts, shocks, wheel bearings, drop links, ARB bushes. Blast and powder coat or laquer springs, banana brackets, ARB, disc shields, spring carrier while everything is off. I had seized bolts a plenty on drivers side and needed to destroy some bits to get other bits off. If there is no play in the rack arm or track rod end then IMHO i think its pointless replacing them .. you will gain nothing from it. Coffin arms are normally replaced due to the bush debonding . The most common noise is a knock which comes from the diagonal arms .. 50K miles and they will be knocking .. it has no effect on anything other than its an annoying noise so thats why you change them . Top mounts on their own is a fair bit of work , fine if doing with springs or shocks but as a stand alone job i would have to question why .. it could easily expand to shocks if the top nut is corroded or even if the top mounts are ... ive seen 997 top mounts totally locked to the shock with the nut off. Coffin arm bolts can sieze in .. either way plenty of ally grease when refitting . ARB are always worth changeing . As mentioned a good ball joint splitter and not the tuneing fork is required . 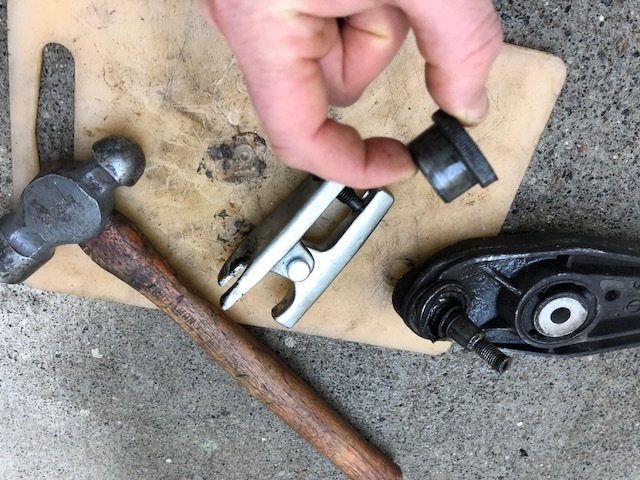 Coffin arm 18mm nut .. if it goes tight when undoing then retighten then undo .. keep doing this .. wire brush to clean threads .. a bit of lub but only on the threads .. dont let it get under the nut .. if it all starts spinning .. ie the ball joint has lost its grip then it becomes rather difficult shall we say. worst way in this situation and you have to cut the nut off .. not a job i like doing and i HAVE to do this stuff . Many thanks for the replies re the coffin arms etc sound advise. well ive ordered new coffin arms, tuning forks, trw boots & outer track rod ends which will arrive in the next few days & the plan is to get the car into the garage in Dec/ Jan to replace the old parts for new, while the car is in the air I will see what ( or I should say my indy ) will see if the car needs more attention but I can cross that bridge as & when. Maldren you mentioned a meet on the 28th at Sidcup so pls forward details as im only a couple of miles away from Sidcup & hope to drive by. Its not so bad. I got to be a dab hand at whipping top mounts out and swapping without removing strut when I got a bad batch of top mounts. I'll admit to using mole grips on rubber around the damper shaft (right at the very top) and an impact gun on the top mount bolt to free them. So my top mount was seized to the piston. In the end I drilled the rubber to separate the main parts of the mount which just left me with the bushing on top. I had split it open by cutting it. There wasn’t any evidence of rust, so it was just jammed on by interference fit it looks like. Anyway - what should have been a quick job, turned into an ordeal - but it is sorted now and ready to go back in. Design911 are sending out a replacement part. No quibble. Fantastic customer service experience.